Chipworks is quick to publish reverse engineering pictures of iPhone 6 and 6 plus: "The iPhone 6 Plus iSight camera chip is housed in a camera module measuring 10.6 mm x 9.3 mm x 5.6 mm thick. 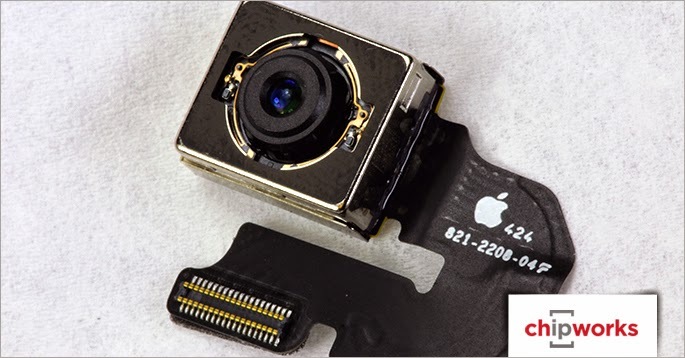 Fabricated by Sony, the iSight camera chip is a stacked (Exmor RS), back-illuminated CMOS image sensor (CIS) featuring 1.5 µm generation pixels (introduced for the iPhone 5s). The die size is 4.8 mm x 6.1 mm (29.3 mm2). The phase pixel pairs have all been implemented in the green channel and cover the majority of the active pixel array." "Our speculation of Sony winning the FaceTime sockets, though, turned out to be correct. We’ve just confirmed the iPhone 6 Plus FaceTime camera is a stacked Sony CIS and will provide more details in a future update." I heard iPHone 6's 8MP CMOS sensor was modified from a 13MP CMOS sensor. Anyone heard the same thing?